More than 150 people braved cold rainy days and Toronto traffic to attend the May Representative Council meeting this year. In addressing the group, President Sam Hammond spoke to the “critically important issues” that would be highlighted over the course of the meeting, including Bill 122, ETFO’s Building Better Schools agenda, and the political landscape in Ontario. He praised ETFO’s Building Better Schools agenda that communicates to members and the public how a better learning environment can be built. He emphasized that even with political uncertainty in Ontario, he was certain that ETFO members would “stand together in solidarity” to protect collective agreements and the integrity of public education. ETFO’s “… and still we rise” annual leadership conference for women featured keynote speakers with important stories to tell. Jane Elliott, creator of the “Blue eyes/Brown eyes” exercise with school children, reminded participants that education is key to stopping racism. Activist Wanda Robson remembered the 1940s when black people were not accepted into teachers’ college. Aboriginal Olympian Waneek Horn-Miller noted that reconciliation is the most important issue in Canada today given that Aboriginal peoples will form the majority in five provinces within 40 years. Participants also helped celebrate Dr. Jane Goodall’s 80th birthday. The well-known scientist and activist’s Roots and Shoots program, promoted by ETFO, inspires students to become active sustainable citizens. In April, ETFO launched its Building Better Schools plan to create a better learning environment for all students. The six building blocks include: small classes for all elementary students; more meaningful student assessment and learning; greater access to specialist teachers; more resources for students with special needs; greater focus on equal opportunity and inclusion; and a strong union voice. Through print and online messages, Building Better Schools seeks to keep in the public spotlight what kids need to succeed in today’s classrooms. For more information, visit buildingbetterschools.ca. The School Boards Collective Bargaining Act, 2014, was passed by the Ontario Legislature on April 8, 2014. This legislation mandates a system of two-tier collective bargaining in the education sector that includes central (provincial) and local tables. Many of the amendments ETFO proposed to ensure that the provincial bargaining framework would be balanced and fair, and would work in the best interest of public education in Ontario, were accepted and incorporated in the legislation. For more information about what the collective bargaining process will look like under the School Boards Collective Bargaining Act, 2014, visit www.etfo.ca/bargainingandagreements/bill122/. The last issue of Voice reported that the Bill 115 Charter challenge would be heard in the Ontario Court in June 2014. The court has decided to postpone the hearing to await decisions from the Supreme Court on similar cases. 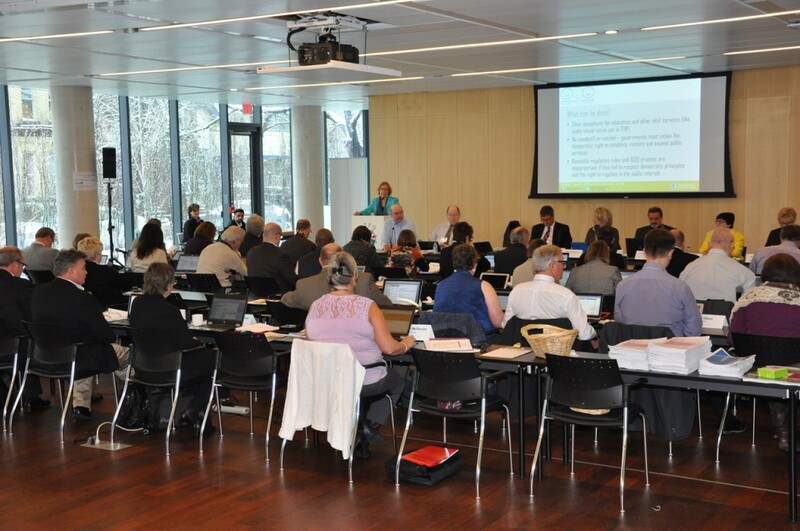 ETFO hosted a meeting of the Canadian Teachers’ Federation’s Board of Directors from April 14-16, 2014 in its new home. CTF board members started with a tour of the ETFO building that has been awarded the LEED Platinum designation for its high environmental standards. Included in the Board of Directors’ agenda was a discussion of CTF’s role in moving forward with issues that affect women and girls. The meeting coincided with Ontario’s first Equal Pay Day to raise awareness of the earnings gap between men and women in Ontario. 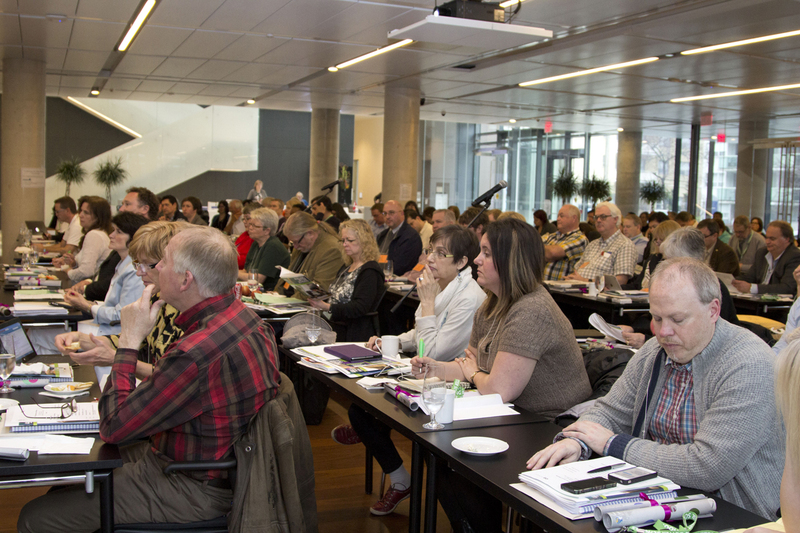 In late March and early April over 160 ETFO members participated in six pre-election training workshops held across the province. Participants heard the results of the latest polls. They reviewed ETFO’s Building Better Schools campaign and contributed ideas for sharing the campaign with members and the public. They learned about the various ways they can contribute to the election campaign, either by working for a political candidate or by promoting Building Better Schools. Finally, they practised knocking on doors. They reported that this practice made it more likely they would volunteer to canvass in the future. Vivian McCaffrey explains how members can get involved in the upcoming provincial election.